One of the added perks of the variety of international keyboards available on the iPad, is that you can have some fun with your folder names. You can choose from foreign languages (I have used Japanese for work-related and Japanese study folders), Emoji, or even Kaomoji. This is exactly what I was playing with this afternoon (instead of completing that pesky grant proposal). 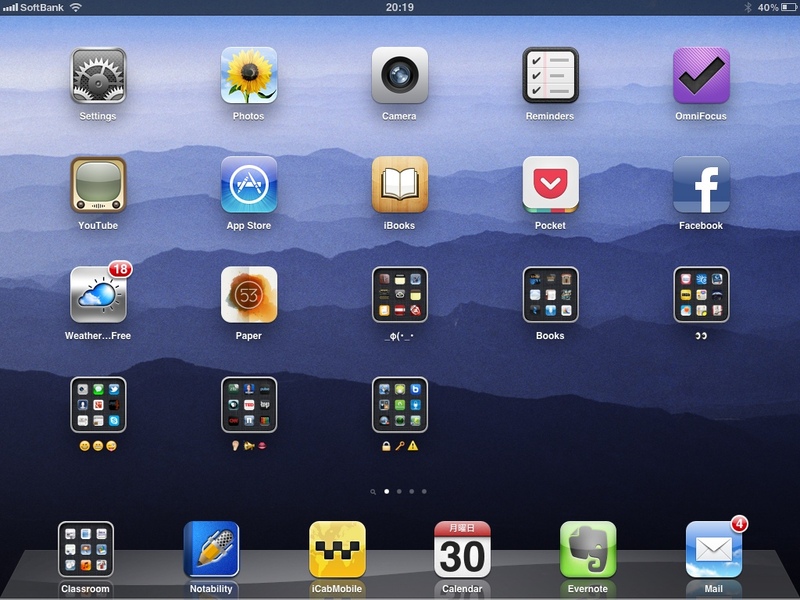 So, this is what my homescreen looked like before having fun with the folder names. After taking this screenshot I tapped the Settings app up in the right corner to check that my keyboard settings included “Emoji” (General / International / Keyboards: Emoji). 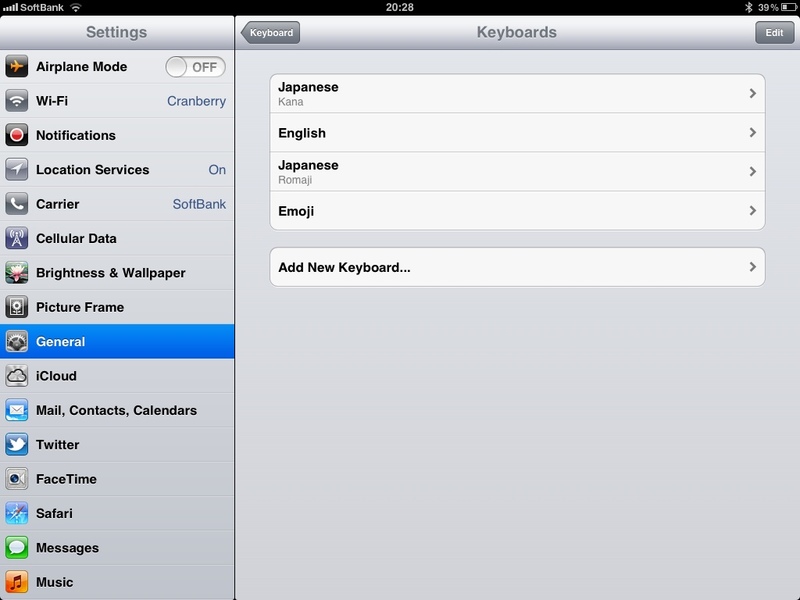 You might notice that I also have Japanese selected, and that will come in handy when adding the Kaomoji. 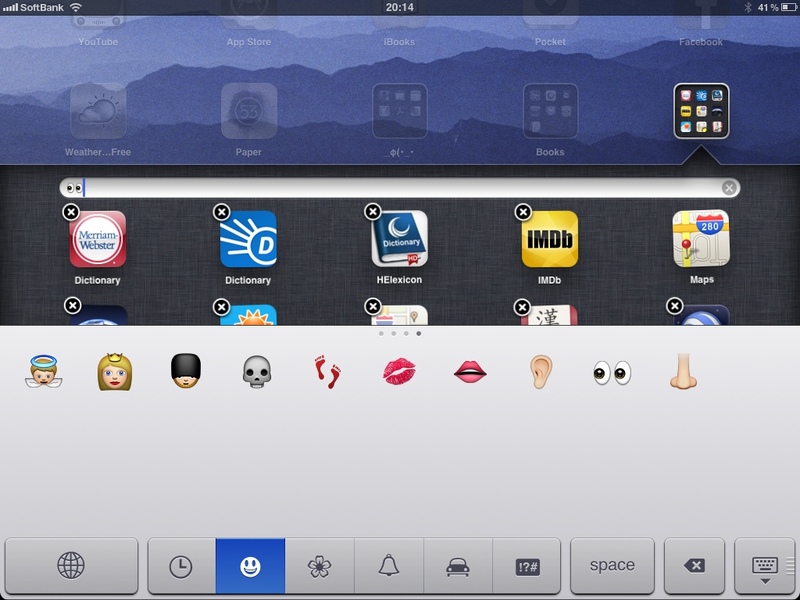 While this screenshot only shows a small sample of the icons available, I was able to find the ‘eyes’ icon here to represent the concept of ‘Search’ for my ‘Reference’ folder. Once I edited the first folder, the rest were pretty easy. I will not bore you with all the screenshots, but I was able to use many other icons and even some Kaomoji for my ‘Productivity’ folder. which to me looks like someone madly scribbling in a notebook. Fitting, considering that the folder contains mostly notetaking and journaling apps. I chose three traditional smiley faces for my ‘Social’ folder, an Ear, Megaphone, and Lips for ‘News’, and a Lock, Key, and Caution icon combination for ‘Utilities’. So, what do you think? Time to have some fun with your folder names? Posted on April 30, 2012 by Steve Henneberry. This entry was posted in Quick Tips and tagged Customization, Fun. Bookmark the permalink.